1. Make sure all air is out of the tube. 2. Loosen the tyre bead from the rim by squeezing the tire together all the way around the rim. 3. Use tyre levers to take one side of the tyre off the rim. Ease one tyre lever in under the wheel rim and lever out the edge of the tyre, and pry it up over the wheel rim. Move the lever around the rim about an eighth of the circumference pulling one side of the tyre out of the rim. Stop, insert the second tyre lever where the tyre first comes came out of the rim and zip the lever the whole way around the wheel. One complete side of the tyre will now be off the rim. You should now be able to remove the entire tyre from the rim using your hands. Slip one side of the tyre completely back onto the rim. You should be able to do this with your hands only. Put a few shots of air in to partially inflate the tube. Insert the tube valve into the hole and then work the tube into the tyre. Take care not to twist the tube! Using your hands only now push the remaining bead onto the wheel. Only if necessary use a tyre lever to do this as you may squeeze the tube and puncture it! 9. VIP: Ensure the tyre beads are seated correctly into the wheel rim walls!!! To do this massage the semi inflated tyre with both hands, moving around the entire circumference, and at the same time pushing the tyre gently "into" the rim. You can also gently "bang" the tyre onto the ground several times , moving around the wheel after each "bang". 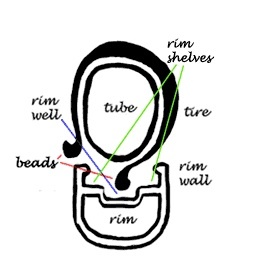 These steps ensure the beads of the tyre are correctly seated into the rim walls of the wheel. 10. Fully inflate the tyre to its recommended pressure. a. The wheel seems to have a wobble in it.